Most aeronautical features have a geographical aspect, e.g. aerodrome reference point (ARP) is located at a certain position, a power transmission line considered as obstacle forming a line or an airspace which has a horizontal extend described by a polygon. What is the difference between AIXM 4.5 and AIXM 5 when it comes to the modelling of such geographical elements? AIXM 4.5 is a customized XML grammar defining its own proprietary elements for the encoding of geographical elements. The example below shows the AIXM 4.5 elements <geoLat> and <geoLong> with their particular format used for the encoding of the geographical position of a Waypoint. AIXM 5 uses a common, industry independent standard for expressing geographical elements: the geography markup language (GML). 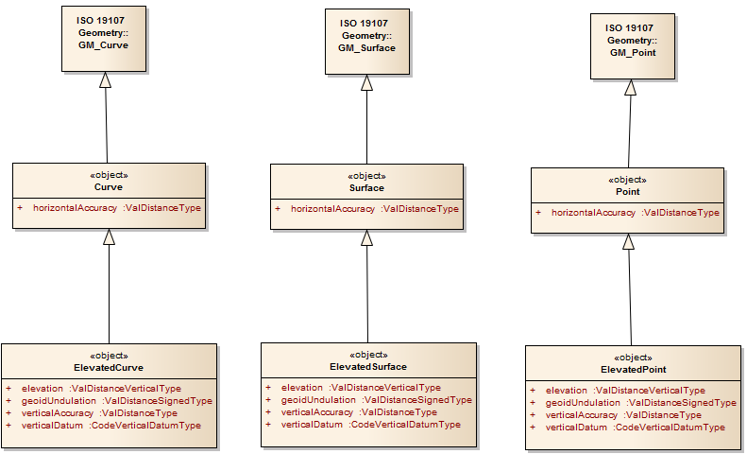 GML has advantages as XML-based geospatial data format. It is an open standard, which is easy to be manipulated and exchanged between different computer platforms and applications. GML version 3.2.1 (used by AIXM) has been published as an International Standard viz. ISO 19136. 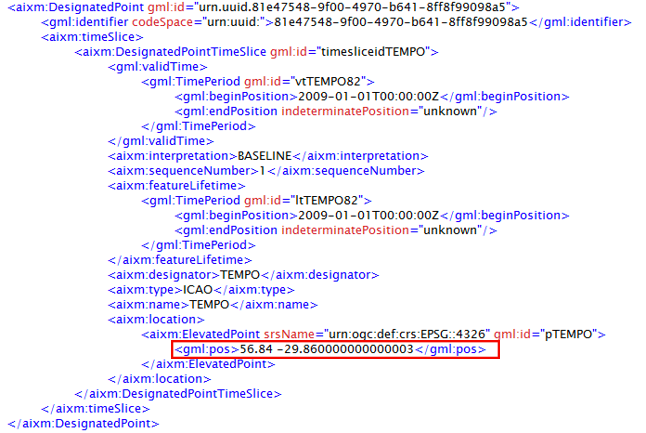 The example below shows the GML encoding of the position of a Waypoint using the gml:pos element. Note that in GML coordinates are expressed as decimals of degrees. No sign or plus sign stands for North and East respectively. A minus sign stand for South or West respectively. GML is very complex. The standard contains an extensive list of geometries, geometric properties and operations, many of which are not necessary for aeronautical information applications. Hence, AIXM 5 uses just a subset of GML elements needed for the encoding of positional and shape data viz. for point, curve (line) and surface (polygon) geometries. On the other hand, the GML standard elements are augmented with specific aeronautical properties, such as bearing, distances from significant points or airspace aggregations. AIXM5 does not use the full 3D capability of GML. 3D geometries are represented as 2D projections with additional AIXM feature properties specifying the vertical dimension such “elevation”, ”verticalAccuracy” or the “AirspaceVolume” class. Therefore, AIXM 5 is considered a 2.5 geometry model. As GML is a common standard for encoding geographical elements it also enables a seamless data exchange between different industries sectors. In this regard the INSPIRE Directive aiming to create a European Union spatial data infrastructure requires GML for data encoding with full implementation required by 2021. This European Spatial Data Infrastructure will enable the sharing of environmental spatial information among all public sector organizations. The Directive addresses 34 spatial data themes, one of them is transportation covering road, rail, air and water transport networks and related infrastructure. 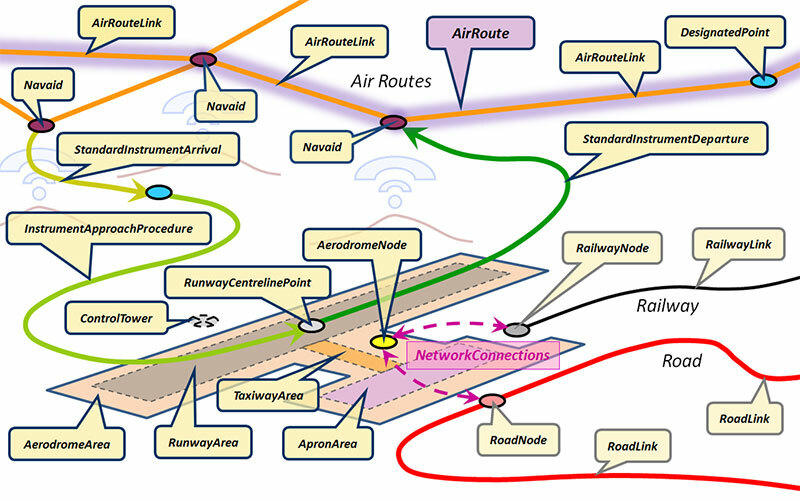 The illustration below shows and example of the use of elements forming the air transport network with connection nodes to other modes of transport. 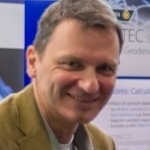 Wolfgang Scheucher is one of the key members of the SOLITEC Aviation team, which represents a perfect combination of IT specialists and aeronautical data domain experts. Wolfgang holds an MBA degree in Aviation and is working in the Aeronautical Information domain as consultant and trainer for more than15 years.